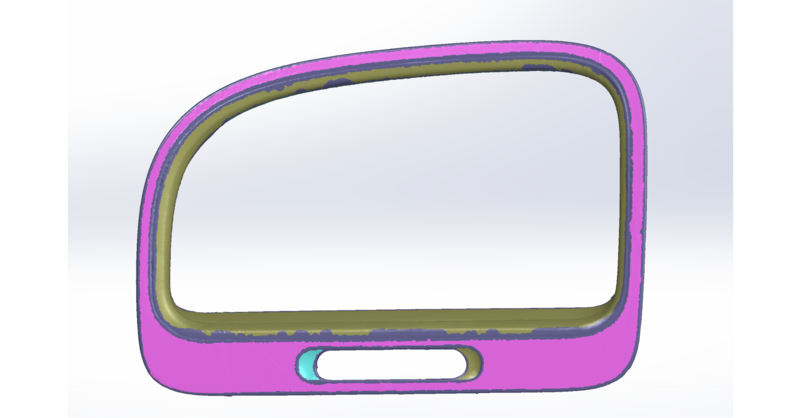 Reverse engineering is a powerful way to create digital designs from a physical part, and can be a valuable tool in your prototyping toolkit alongside technologies like 3D scanning and 3D printing. 3D scanners measure complex objects very quickly, and can speed up your design workflow tremendously when real-life references are involved. With the ability to capture and modify physical shapes, you can design 3D printed parts that fit perfectly on existing products of all kinds. 3D printed jigs allow you to repeatedly locate a drill or saw, or assemble parts precisely with adhesive. Create close-fitting, reusable masks for sandblasting, painting, or etching. In this post, we’ll walk through the step-by-step reverse engineering process for an aftermarket digital gauge, with tips along the way for using the right reverse engineering tools, from CAD software to to 3D scanners and 3D printers. For a full breakdown of 3D scanning workflows and technologies, download our white paper. One of the biggest challenges people encounter when converting physical objects to digital is a major incompatibility between two different types of 3D models: meshes and solids. A 3D scanner outputs a mesh, rather than a constructive “solid” model. Meshes need to be reverse engineered to be made editable. Meshes are the main output of all 3D scanners, and the format commonly understood by 3D printers (STLs). A mesh represents the surface of a shape with a large number of triangles, connected edge to edge. Mesh models don’t contain any information about the object, besides the position of the triangles that define the shape. On the other hand, engineers are trained to work with solid models. Solid models hold information about how an object is designed, and this information is explicitly encoded into the model as features in a ‘stack’ of logical steps. In solid CAD, it’s possible to change the dimensions for a single feature, and the rest of the model will update to accommodate the change. 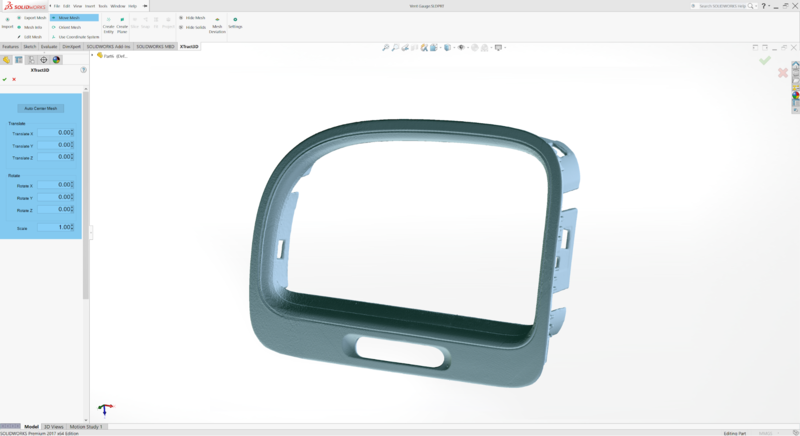 Since meshes lack information about the construction of the object, the ways you can alter a mesh model are limited—CAD software like Solidworks and Onshape can’t directly modify meshes. 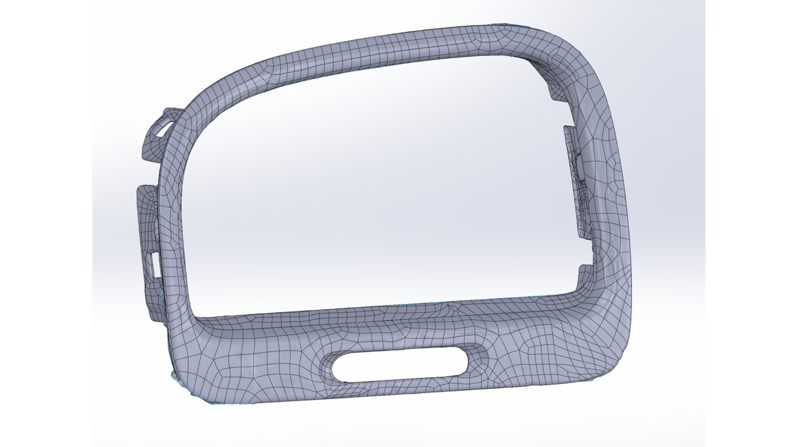 If you need to make major modifications to the underlying design of a scanned part, the mesh needs to be converted to a solid CAD drawing: this process is reverse engineering. Reverse engineering is important when you want to create new parts that reference or incorporate older designs, where the original CAD design isn’t accessible. For example, you can create replacement parts that match the original design of damaged existing pieces, or use reverse engineering processes to integrate complex surfaces from existing objects into 3D printable jigs, which are useful when modifying mass manufactured and handcrafted products. To demonstrate the basic steps in a reverse engineering workflow, let's take a look at the process for creating an assembly jig for an aftermarket digital gauge that fits onto the air vent of a Volkswagen Golf. 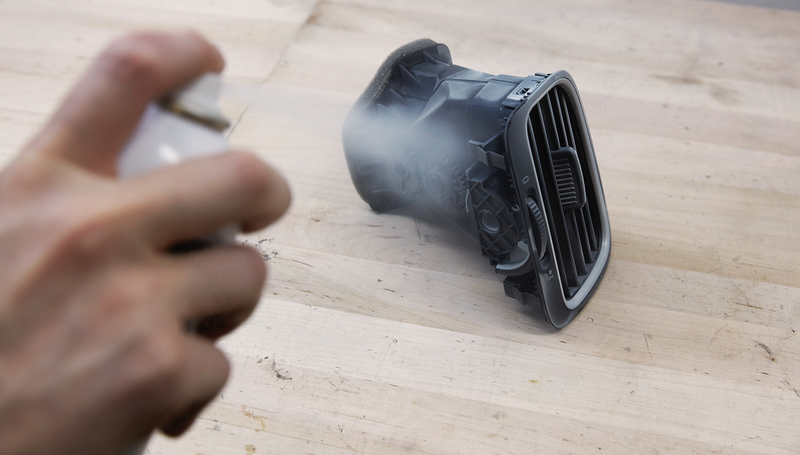 Spray coat the object with a temporary matte powder to improve scan accuracy. Even slightly glossy surfaces tend to degrade scan quality, while reflective and transparent surfaces cannot be scanned at all without a matte coating. Use a temporary matte powder to improve the scan accuracy of your object. Use a high accuracy 3D scanner to capture the important sections of the part. 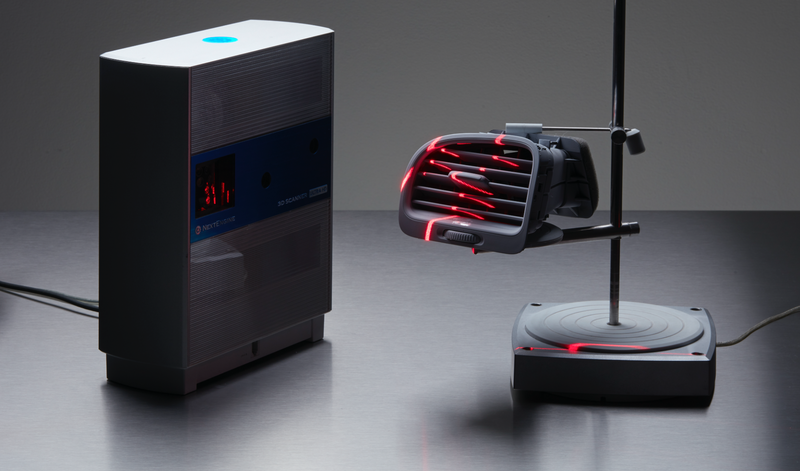 Tabletop structure light or laser scanners are the right tools for the job, with accuracy of ±100 or better. Learn more about how to choose the right 3D scanner for your application in our 3D scanning white paper. Note: You may need to orient and re-scan your object several times if the object has deep recesses. Some scanners produce extremely large mesh files, which will make later steps grind to a halt. Scanner software repairs small gaps and simplifies the scan, making the data more manageable in CAD. Try to reduce the model as much as possible without destroying important details. Tip: If you need more control, Meshmixer is a great choice for refining scanned meshes. 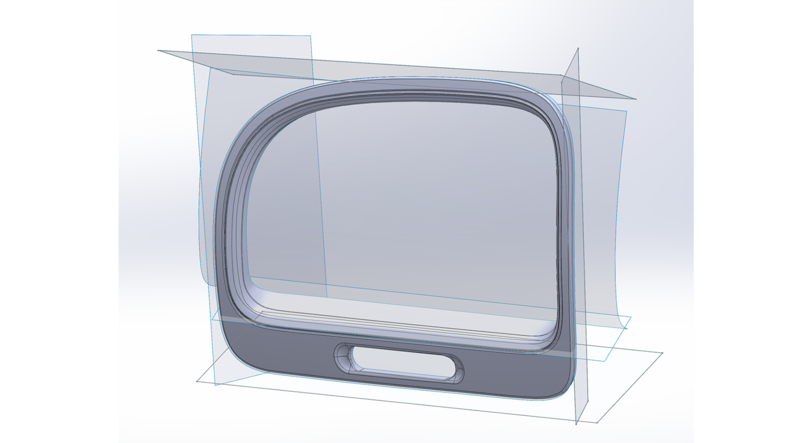 Import the mesh into CAD software equipped with reverse engineering tools. Geomagic for Solidworks is a powerful choice for resurfacing complex, organic shapes. If you are reverse engineering a part with simpler flat surfaces, Xtract3D is a less expensive, lightweight alternative. In this step, move and rotate the scan mesh into alignment with any existing design components. Tip: Make drawing easier by rotating and aligning your scan to face the orthographic view directions. There are three paths to extract the shape of the scan in order to create a solid model that is editable with CAD tools: semi-automatic surfacing, automatic surfacing, and manual redrawing. Complex curved surfaces are difficult to manually draw, so you may choose to use semi-automatic surfacing. This function generates surfaces that fit to detected regions of the scan. By varying the sensitivity of the surface detection function, different surfaces will be found. Tip: Geomagic for Solidworks detects surfaces on the scan to fit 3D curves. Use a “brush” to manually add or subtract areas on the scan from each region. You may need to repeat this process several times with different sensitivity settings to detect all your surfaces. These surfaces can then be trimmed and knit together to create an editable solid. Use semi-automatic surfacing to re-create curved shapes when you want maximum editability later on, and when sharp edge accuracy is important. The re-surfaced result, after trimming. Automatic surfacing generates a solid model from any watertight scan. You can use standard CAD tools to subtract and add to this auto-surfaced body, but it will be more difficult to move basic features around on the body itself. You may not need control over edge placement. For example, if you are scanning a part of the human body to create custom ergonomically-shaped products, or want to create a jig to precisely or repeatably modify a handmade object. In these cases, automatic surfacing is a great way to save modeling time. Note: Compare the results of a automatic surfacing to semi-automatic surfacing: some accuracy is lost, especially around sharp edges. For simple features such as bosses, holes, and pockets, it’s usually fastest and most accurate to redraw the features using the scan model as a reference. Reverse engineering software allows you to create sketch planes aligned with flat surfaces on the scan and to extract cross sections from the scan mesh, which helps you match the shape of the original object. Once the scan has been converted to a solid, it can be subtracted from another solid body to create a jig that securely holds the original part. The design of the new gauge component also references the dimensions of the scan, using curves extracted with semi-automatic surfacing. Printing the jig on Formlabs Form 2 stereolithography (SLA) 3D printer gives you a high degree of accuracy comparable to the output of engineering-grade 3D scanners. Use Formlabs Rigid Resin for its strength and precision. 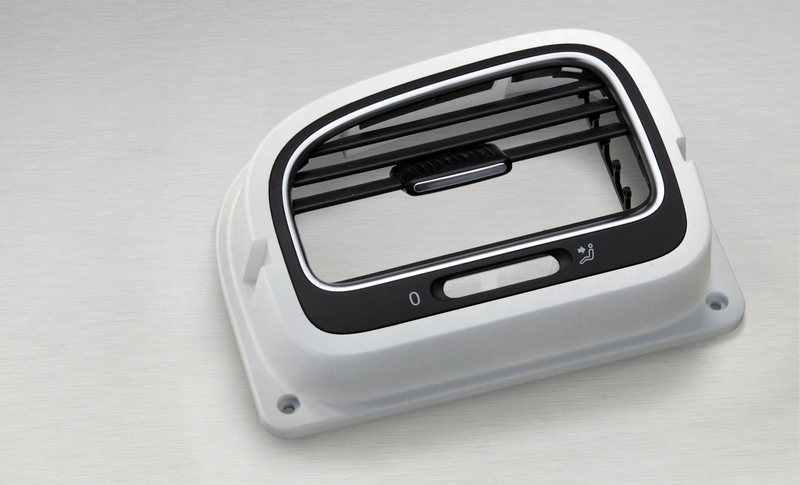 Request a free sample part printed in Rigid Resin. Once these steps are complete, the 3D printed jig is ready to use to assemble the new gauge onto the OEM air vent. The final 3D printed assembly jig, printed in Rigid Resin. New to 3D printing? Learn more about stereolithography technology, and watch a webinar to explore additional production applications.